Digital Photography has indeed simplified the task of producing quality images of the moon. The ability to mount my old 600 mm manual mirror lens to the body of my DSLR has allowed me to capture some good images indeed. However to push the challenge further I have for past few years been a keen “Moon transit” photographer i.e. 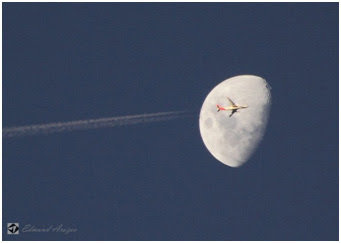 capturing aircraft as they fly across the face of the moon. I am fortunate that where I now live the Moon’s orbit and most of the commercial flight paths make it easy for me to set up my gear in my back balcony or backyard to achieve this. In addition there are many on-line apps that allow real time monitoring of flight paths. However this quest requires lots of patience and luck. Often there are long periods of waiting in-between flights. During these breaks I find myself staring at the moon and my mind wanders back to my kampong days in Singapore. I start thinking of the significance the moon played then and the beliefs both religious and superstitious of the various races and groups of people in my kampong. One colourful memory that I always chuckle when I think about it is the ritual that my Chinese neighbours undertook during the eclipse of the moon. I remember as a kid suddenly hearing the din of pots and pans being struck constantly. Even the large kerosene tins would be brought into play. Most of the Chinese households would be involved and I learnt that the belief was that a Dragon was swallowing the Moon and the noise created was to scare the dragon from completely removing the Moon from the sky. This ritual did go on regularly whenever there was an eclipse for most of my early years but as society became educated the practice faded away. When I relate this to some of my friends a few remember this practice but others think I made it up. In the past the Malay Hari Raya dates were determined by the sighting of the new moon by local religious authorities. During those pre mobile phone years the method of relaying the successful sighting was by the use of carbide cannons. Carbide was mixed with water in the hollow of a bamboo cylinder and when the fuse was lit a small explosion took place and this could be heard for miles in the quiet of the evenings. When this was heard in a kampong one of the Malay families would then in turn fire a cannon and the message would then spread from kampong to kampong until the entire Malay community across the island would be informed to start celebrating the following day. For the Eurasian and Christian households the main festival linked to the moon was Easter which is held on the first Sunday after the first full moon occurring on or after the vernal equinox. The other Holy days of Lent are adjusted accordingly. As kids when we were brought by our parents for the traditional “visitations of churches” on Maundy Thursday we often noticed the bright nearly full or full moon as we walked along the Queen Street / Victoria Street area. The significance of the moon was unknown to us or rather we were more focussed on the treats that we were rewarded with for being well behaved. Treats like freshly baked Hot Cross Buns from the two well-known bakeries around the vicinity “Ah Teng” and “The Red House Bakery”. The other treat would be the Kueh Putu Piring (or Kueh Tutu as it is now known as). Similarly the dates of Ascension Thursday and Pentecost Sunday vary each year. The former celebrated forty days after Easter, and the latter ten days after the Ascension (50 after Easter). When Armstrong landed on the moon in 1969, you can just imagine the reaction from the different families in the kampong. There was disbelief, taunting and scepticism. The full or near-full moon was often a blessing if you came home late at night because it lighted your way home. There were no street lights in the lanes leading to our houses. With the moonlight we could avoid the portholes and on rainy days the resultant puddles that were ever so present. However the moonlight also did cast numerous shadows from the trees and bushes. With movies like “Pontianak” on our minds combined with the fragrant scent of the newly blossomed frangipani flowers walking home usually turned into a quick paced trot. 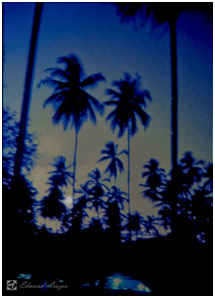 I guess these days in Singapore, the Moon between coconut palms is only a recollection of some of the older generation. Moonlight between high-rise would be the norm. I was of age to bang pots or just empty tin cans when there's eclipse of the moon. Another Chinese belief is that one should not point at the moon or there will be a cut at one's ear lobe. When I told my father about Armstrong's landing on the moon, his reply was "That's what the American says. Whose to know if it is true?" Edmund, thank you for such nostalgic recalls. Explained every thing in detail. The most beautiful good morning and Good Night Messages, love quote & Romantic Messages. The shown weather is so adorable, would love to live there. An interesting discussion is definitely worth comment. I do believe that you ought to write more about this subject matter, it may not be a taboo subject but general, lay people do not talk about these issues. To the next! Cheers!! You don't require taking any stress over anything. All our Doha Escorts are wanted to carry out this activity since they are exceptionally and loving.